The Kalahari Crafts Are Tested and Ready! 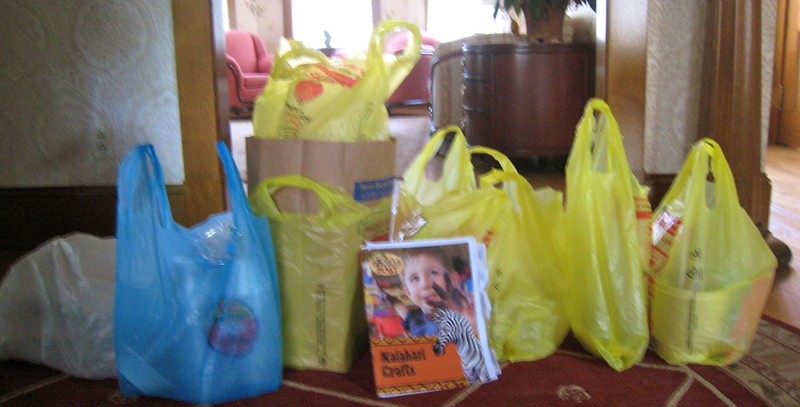 Kalahari Crafts materials sorted by project, bagged and ready to go! Calling all kids and kids at heart! This coming Sunday evening my church kicks off five days of vacation Bible school (VBS). If you are in preschool through sixth grade and plan to attend you’ll be working a craft a day with my friend Tara and me. ”What’s the theme?” you ask. Why “Baobab Blast,” of course! My creative and artsy friend Kathy is creating the African plains, complete with large animals and a huge baobab tree under which we’ll gather each day. It’s really impressive! I’ll take a photo to show you when she’s finished. As the craft(y) leader I got to choose the projects the kids will do. With the Kalahari Crafts book offering multiple possibilities for each day, I had fun deciding. I figure you know me well enough to know that I’ve made each craft once already; I don’t want 15 or 20 kids staring at me awaiting an explanation if something doesn’t work out very well during the actual craft time! Two sizes of paper trees. I like the larger one. 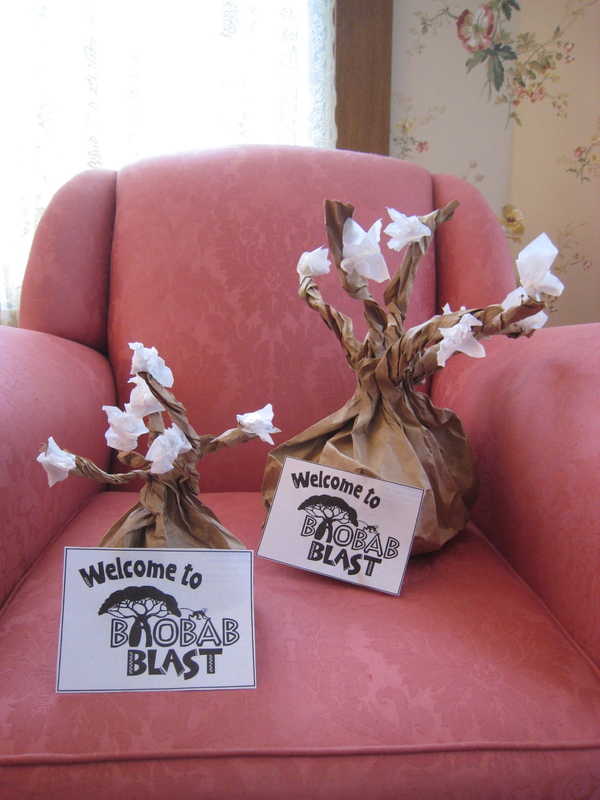 Anyway, the “baobab trees” I made a few weeks ago are the kickoff craft on Sunday night. I tested them in two sizes and much prefer the look and ease of making the trees using the larger brown bags you can get from your local food store. 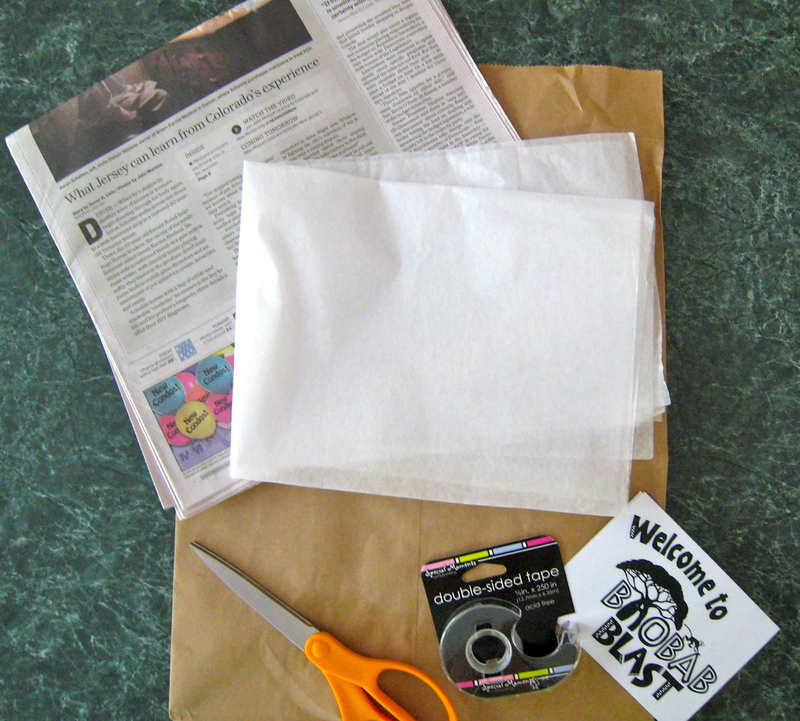 The bags, once cut properly, are easier to manipulate into “branches” and stand firmer on their bottoms when stuffed with newspaper. Even though my husband Mike thought they were azalea bushes when I proudly showed him the samples, I think they look pretty cool. Can you believe THIS is all you need to create those trees?! 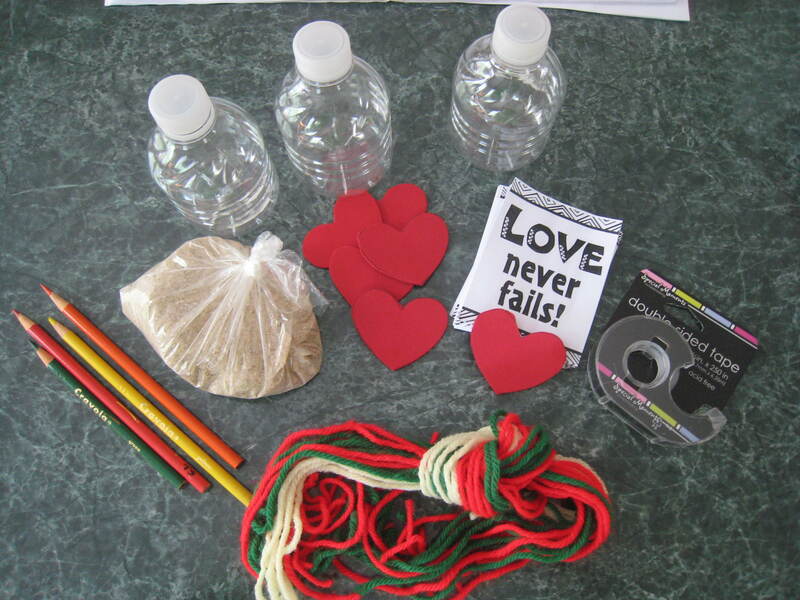 On Monday, the kids will craft a “Love Message in a Bottle.” I precut the ‘message,’ yarn and hearts used in the project for the younger kids so they can assemble their bottle easily in the time allotted. The older kids can design/cut their own messages and yarn. 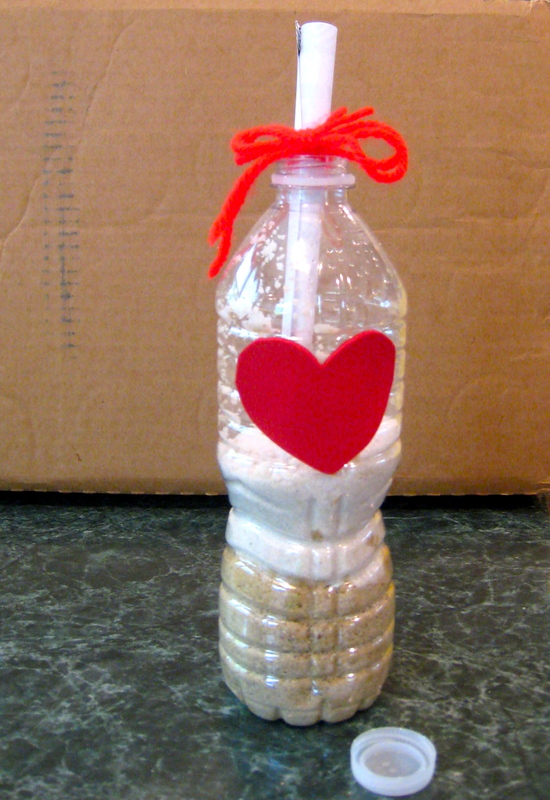 One helpful hint (thanks to my daughter Tory who figured this out): Make sure the kids fill the bottles with enough sand to keep the love messages within finger’s reach; the first time I inserted the love message I needed skinny tongs to retrieve it since I hadn’t put enough sand in the bottle. And use colorful sand when you work with the kids; my sample is dull! These supplies don't cost much at all! 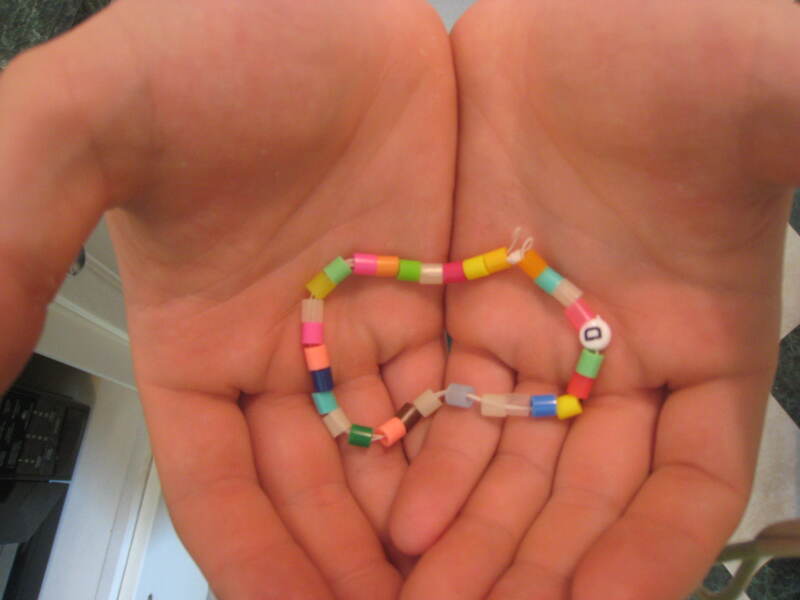 Encourage the kids to use more colorful beads than Max did! On Tuesday, my son Max and Tara will work with the kids since I’ll be at work. The Beaded Friend Anklet is the craft of the day. Max didn’t have any difficulty making the sample anklet; he said to just make sure the knot at the end is large enough to stop the beads from popping off. 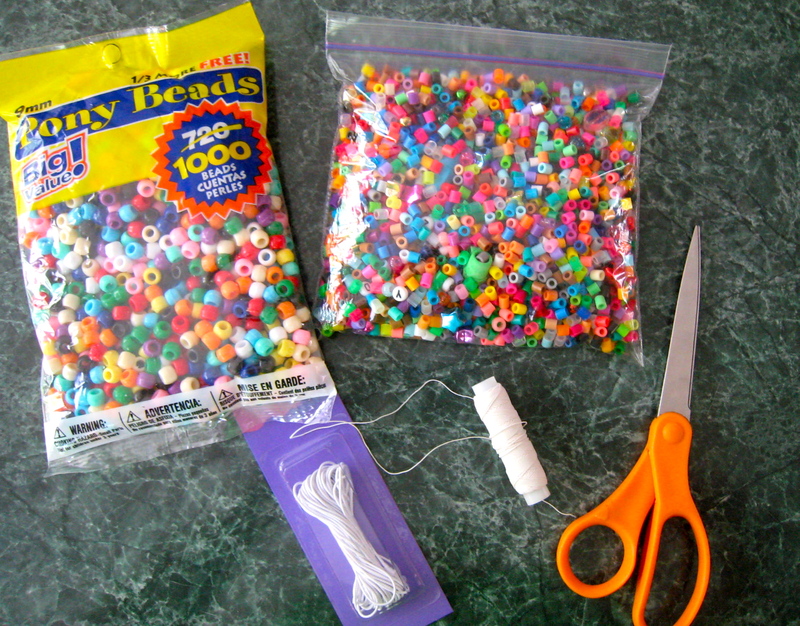 The kids will make an ankle bracelet out of stretchy thread and pony beads. Max was a little puzzled why he has to do the ankle bracelet project, but when I explained the whole “project a day with Bible lesson” methodology he didn’t balk. I love that boy! More very inexpensive supplies to make the anklet. Sounds like it will be fun 🙂 Hope you have a blast, crafty mama! You are the best!! Central’s kids will have a fabulous time because of all of you – thanks.